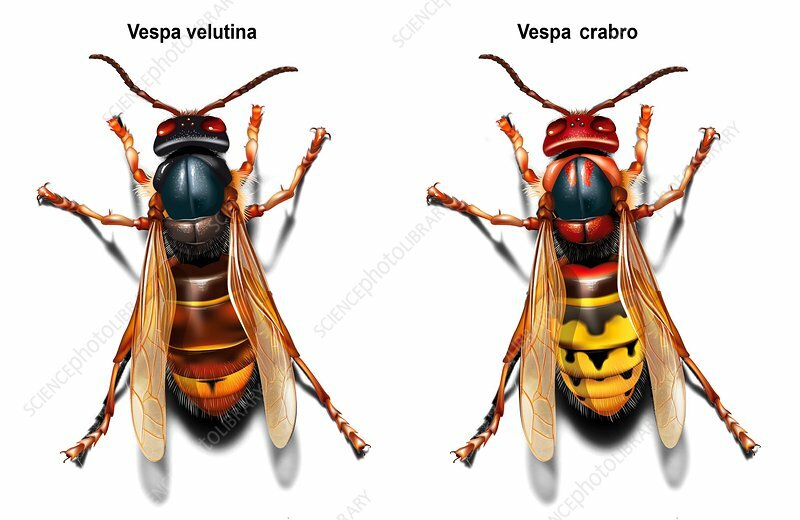 Asian and European hornets, illustration. At left is the Asian hornet (Vespa velutina). At right is the European hornet (Vespa crabro). The Asian hornet is an invasive species. It will capture, kill and dismember bees and carry them off to feed its larvae. Once a beehive is found by this species, the entire population of bees can be killed within hours. This hornet, also called the Asian predatory wasp, is native to China. It has become an invasive species in France, first appearing in around 2004, and has been spreading since then, reaching northern Spain in around 2010. The European hornet is the largest of the European wasps, and can reach a body length of 3.5 centimetres.